Since the rain continued through out the day, I stayed on the yummy warm comfort food path. 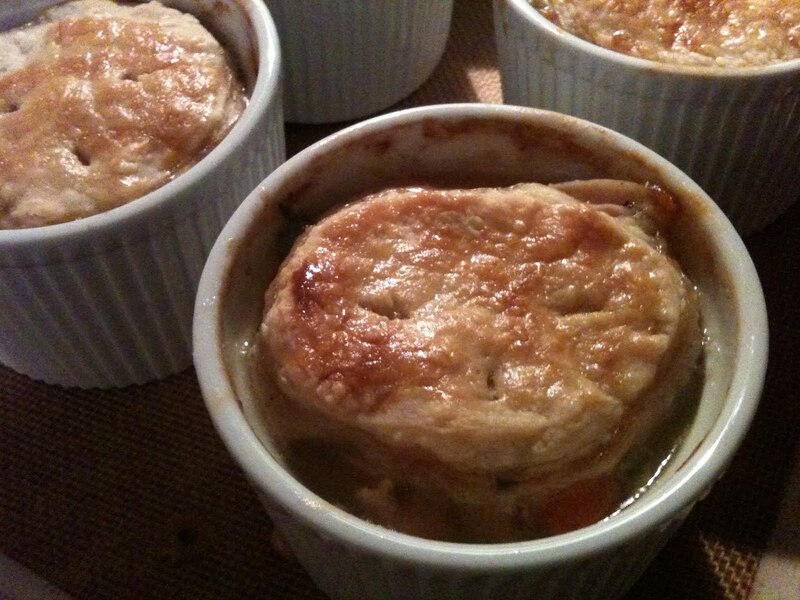 I made individual Chicken Pot Pies, a big favorite in my house. I use the pastry dough from Trader Joe’s, it saves on time, but I always make my own chicken stock. There is nothing like homemade stock. Take the time to whip up a big pot and freeze it for future use, you’ll be glad its there. I’ll post my method for chicken stock next. These are great to freeze for lunches. I’ve even froze a bunch, packed them in my suitcase and flew to Seattle, they arrived cold and ready for the oven. They’ve been a big hit for dinner parties as well. Be sure to gather good veggies for this recipe, celery that’s bright green and has that salty crisp to it. Fresh herbs and sweet young carrots. As for the chicken breast, you can use already cooked chicken from the store, but it’s so easy to cook up your own. I take the chicken breast and pound them out really thin in a zip lock bag, then season with ground white pepper and mineral salt. These will cook very quickly in a saute pan with very little oil. They come out super moist and delicious. Tear them up in whatever size pieces you want, don’t chop it, it looks too commercial chopped. Really, you can do whatever you want, I’m just saying. Photo note: The first picture was from a previous cooking session, I just liked how the pastry came out on these.The remaining pictures were taken at night and appear a bit blurry. Bare with me, I’m working out my lighting issues. All these were taken with my iphone. Preheat the oven to 400 degrees F. Ready a sheet pan with 6 (10-ounce) ramekins. 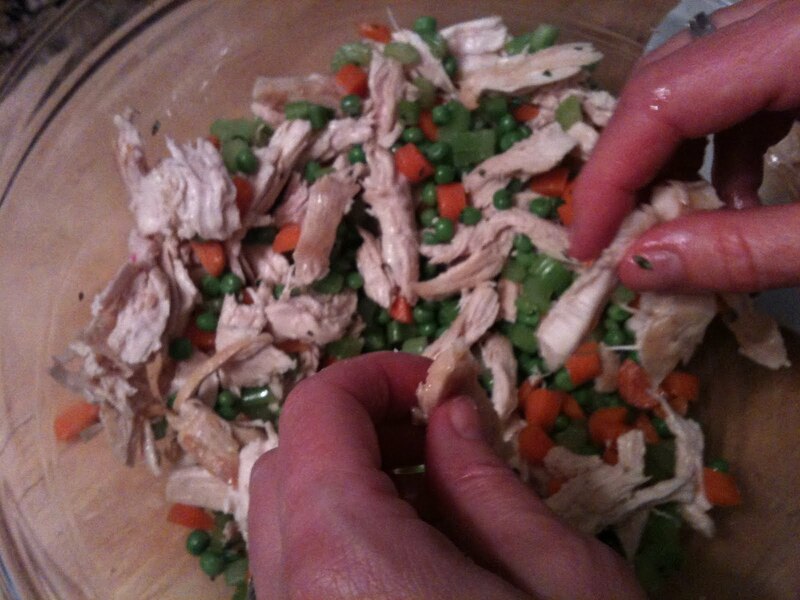 In a large mixing bowl gently combine the carrots, celery, potatoes, peas, herbs and parsley, add the torn up chicken breast meat and set aside. Gravy time, don’t be scared, it’s easy, just don’t leave the pan and stir stir stir. In a large sauté pan melt the butter, add flour and stir into a paste and cooked until browned. Slowly add the hot chicken stock 1 cup at a time with a whisk until mixture becomes thick and gravy like, salt and pepper to taste. 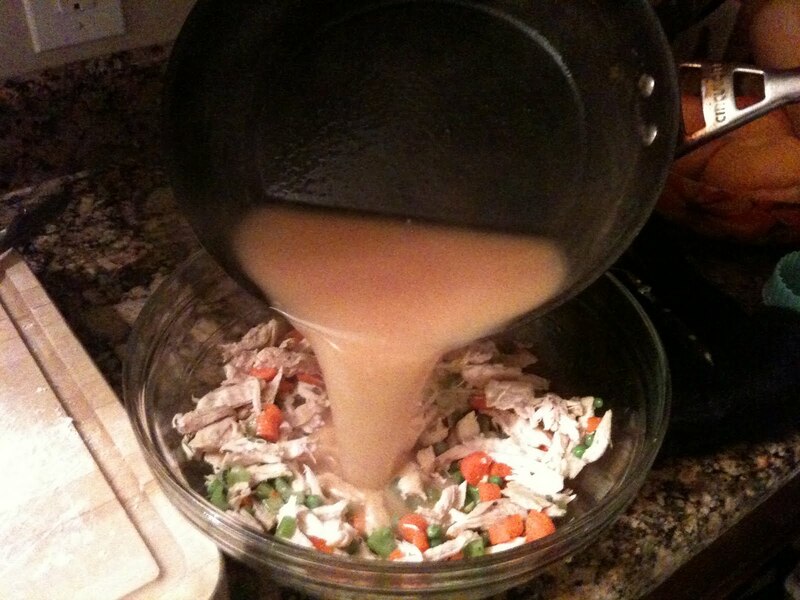 Add gravy to veggie chicken mixture in a large mixing bowl. Place a puff pastry sheet on a lightly floured surface, and roll out slightly. Cut the pastry into 6 rounds to fit the bottom of the ramekins. Place each one in the bottom of the ramekin and bake the bottoms for 10-15 minutes or until browned nicely. 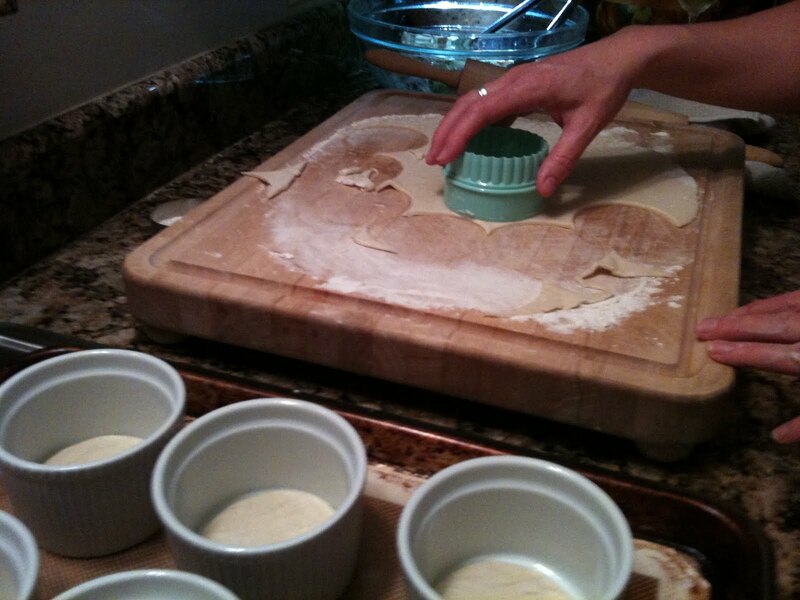 Cut the remaining pastry into 6 rounds to fit the top of the ramekins, set aside in fridge on a baking sheet. 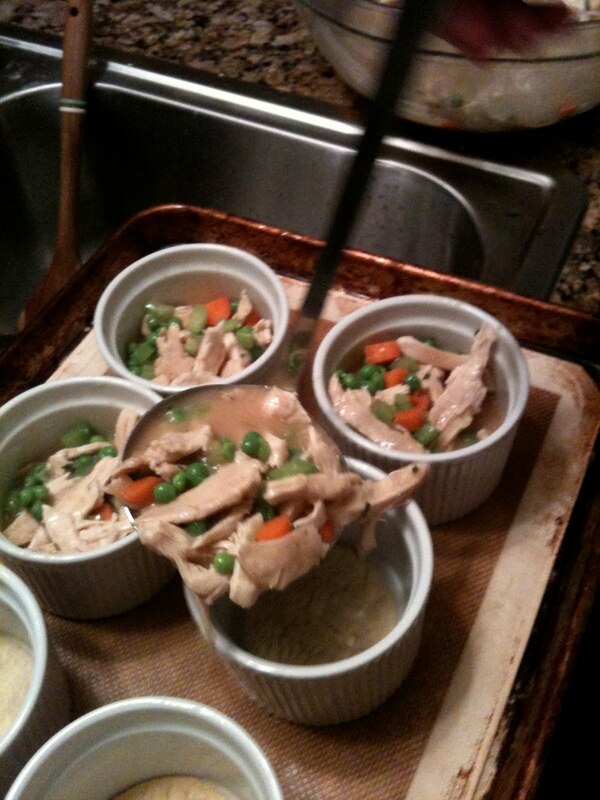 Fill each ramekin with the veggie chicken mixture. 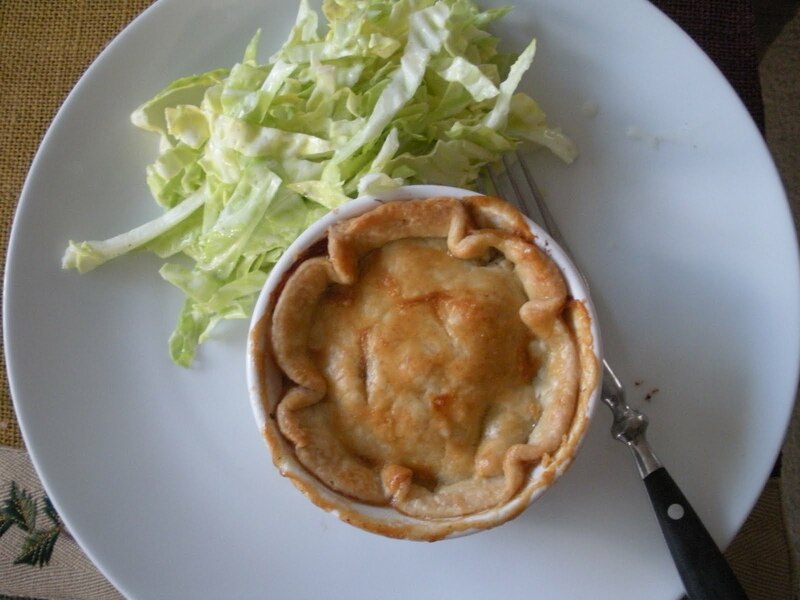 Place chilling uncooked pastry atop each pie, brush with egg wash and slice a few half inch vents in the pastry tops. Bake at 350 for 20-30 minutes or until browned and bubbly. Serve with Cole Slaw on the side. This entry was posted in Comfort Food by Sarah. Bookmark the permalink. >I love these Indi-pies. They look great. Congrats. I am looking forward to what is next. >I love this blog! I'm a big time home cook, so I'll totally follow you here. Your kids won't remember how much money you made, but they'll remember your biscuits. I like the individual pie idea because you arenn't worried about serving. Super fun Sarah!